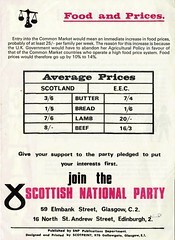 SNP Leaflet, Hamilton by-election, 1978, originally uploaded by Scottish Political Archive. 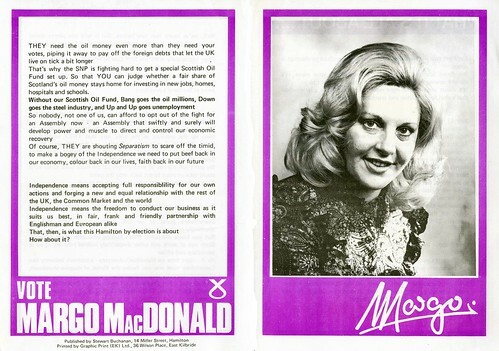 Margo contested the Hamilton constituency in 1978, which went to George Robertson. 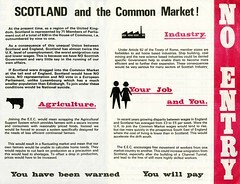 This leaflet forms part of the Gordon Wilson collection. Gordon Wilson was MP for Dundee East between 1974 and 1987. He was Deputy Leader of the SNP between 1973 and 1974 and leader from 1979 to 1990. He has participated in an interview with the Scottish Political Archive discussing his memories of the 1979 and 1997 devolution referendums. 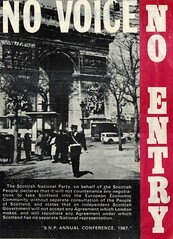 His interview forms part of the Devolution Referendums Oral History Collection within the archive.